Let's get the elephant in the room out of the way, shall we? I live in southern California as you all probably know, and while I love it here, I really do wish that we could experience Fall properly like most of you do. I keep joking with all of my friends that Fall is a mythical term here, because it really doesn't exist. I do however like to pretend that I know what I'm talking about. It may not be cooling off anytime soon, but I try to incorporate as much Fall as I can by changing up my accessories and beauty products to reflect the new season. I've asked my blogger friends from different areas of the country (and Canada) to compile their personal "must-haves" lists for Fall, but I will begin today by sharing mine. I am lumping mine into two categories, style and beauty. My list doesn't change much from year to year, but it's fun to reflect anyway. All of these are classically Fall, with one trendy piece thrown in. If you have any questions on specific products shown, feel free to ask! I decided not to describe why I chose these because I think they are fairly obvious and speak for themselves. The second portion of this post will be up on Monday, and I can't wait to read how my list compares with my blogger friends. Haha, Fall really is a myth here, isn't it? At least in September it is! October starts dropping hints of fall at least. Totally agree with all of your fall must-haves (okay, well, except the cape since I don't have one, but I can see why you like it for Fall!). Fall nails are my favorite and I always love your collection of burgundies and reds! I lived in the tropics for 5 years when I was younger. There were no seasons except for dry or rainy. I missed seasons so much then! So now I never complain about them even if I'm buried under snow in the winter and melting away in summer, lol! Yes, the essie a Fall collection is selling well! I only got one polish, but I'm happy with it! I like capes because they sort of drape to the body. They are looser fitting do I see what you mean about the waist. This still gives me one though. Especially if you pair it with a tighter top and skinny jeans or leggings. You may want to try one! Love your picks! I need a few more cardis, this one is perfect! Gina, Zeba, and Rachelle: thank you ladies for participating! I've already seen what you sent over and all of your picks are also great! Excited to put it all together this weekend! 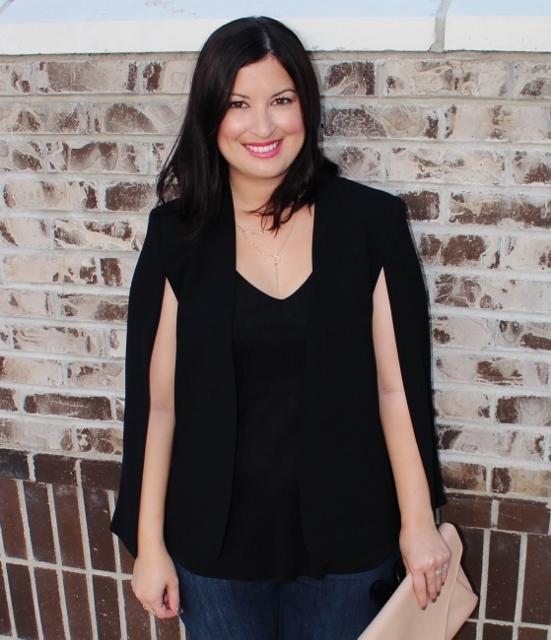 Love the color of that bag, and that cape blazer is super fun! Such a nice collection of cosmetics you have shared here with us for make-up. I really liked your post. Thanks for sharing here with us. Love the bag! I've been looking for a bag in a similar color in faux leather that I can use in the rain worry free lol! No luck yet!